Extremely suspenseful and enigmatic! 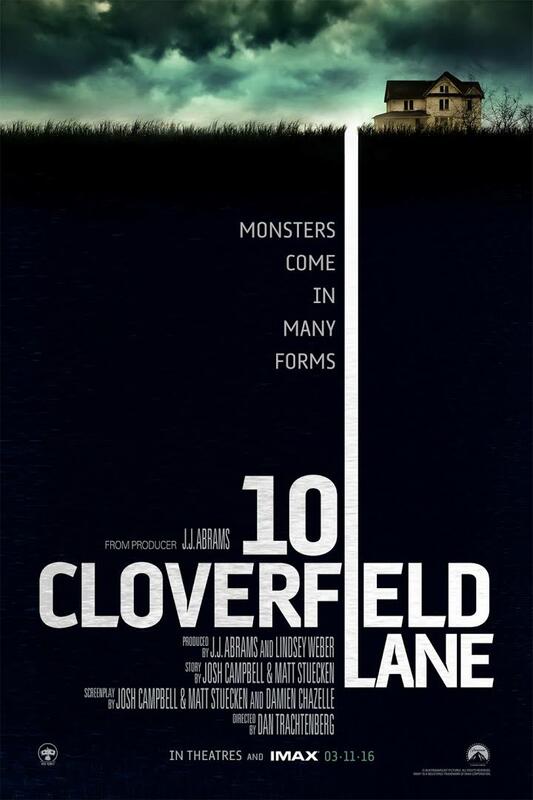 Within minutes of the beginning of the movie, you will be sucked into the twisted and claustrophobic subterranean world at 10 Cloverfield Lane. Not directly connected to Cloverfield (2008), this film quite possibly takes us to a moment concurrent to or just before/after the events in New York City caught on the handicam. Director Dan Trachtenberg and Producer J.J. Abrams work together to shock the audience with a movie that will keep you guessing right up until the end. Brilliantly cast and written, 10 Cloverfield Lane is an excellent old-school feeling horror film that you have got to experience in IMAX. Just when you think you have it figured out, you will immediately begin to second guess yourself. Probably the most brilliant part of the film is the fact that three principle characters can keep your interest and attention the entire time without ever a feeling of boredom or annoyance. From the writing to the cinematography and visual effects, this film is sure to keep you on the tip of your toes. Following a car accident, Michelle (Mary Elizabeth Winstead) wakes up with an IV in her arm and chained to a wall [wait, is this Saw?]. With no cell reception and no recollection of what happened, she begins to fear the worst. Upon meeting her capture Howard (John Goodman), she fears for her life. Not buying his story about saving her and keeping her from the hard during the fallout from the attack, Michelle attempts to escape. Failing to overcome Howard, she slowly begins to accept the worst. To her surprise, she is not the only one in Howard’s fallout shelter. Michelle meets Emmett (John Gallagher Jr). Thinking that Emmett’s injuries are from escaping, she learn that his broken arm is from fighting to get INTO Howard’s shelter. With this new revelation, Michelle begins to settle into life with Howard and Emmett. Still, something just isn’t right. From car noises to sunshine, Michelle has doubts of the alleged apocalypse and must solve the mysteries, puzzles, and covertly plan her escape. One of the most intriguing elements of the movie is personally feeling the claustrophobia that the principle cast is experiencing in the movie. That is thanks to the excellent cinematography, production design, and lighting. That additional experiential element is not terribly common in films, even horror cinema. But it was very instrumental in generating the feeling of suspense, anticipation, and intrigue during the movie. Much like Super 8 and in the vein of other J.J. Abrams’ Bad Robot productions, the movie begins with a fantastic and blood curdling accident. Just like a rollercoaster, once that car accident hits the screen, the movie will take you up and down thrilling hills on a track that you will struggle to see 10 feet ahead. It’s difficult to talk about how the movie keeps you guessing and second guessing yourself without giving away a lot of what makes the movie thrilling. So, you will just have to take my word for it. Like with any good horror/suspense movie, it is necessary to include strategic comedic relief or lighthearted moments. And writers Drew Goddard, Daniel Casey, Matthew Stuecken, and Josh Campbell weave together a brilliant combination of terror and humor to keep the movie alive and dynamic. John Goodman is absolutely brilliant in the film. Not that he has anything to prove. He is one of those actors who, with the slightest tweak of the face or shift of the eyes, can have you laughing one second and terrified the next. His ability to turn his character’s emotion on a dime makes him equally weird/quirky and frightening all at the same time throughout the story. Is he a weird old man who, in his own awkward and bizarre way, is keeping Michelle and Emmett from hard or his is a sadistic serial killer who forms inappropriate intimate bonds with his “guests”? That is for you to discover in the movie. Both Mary Elizabeth Winstead and John Gallagher Jr were perfect choices for their respective roles as well. Winstead brings that independent spirit and look to the character of Michelle and Gallagher provides the audience with a country boy charm. The ability for an actor to capture the emotion of extreme terror and sell it as a legitimate, believable emotion is tough. Selling that acute and powerful emotion can make or break a horror film–if the director’s intent is to make the story as real as possible and not a parody or satire of itself. You may be wondering how this film is even loosely connected to 2008’s Cloverfield. And that connection isn’t really made until the end of the third act of the movie. Unfortunately, I cannot go into too much detail without giving away the climactic and over-the-top ending, but I can say that it does a great job of being connected just enough that it can essentially stand on its own but when you think of how it is or could be connected to Cloverfield, then the movie becomes all the more intriguing. Interestingly, the manner in which this installment in the Cloverfield universe was directed and produced, it definitely could begin a franchise with movies that are never directly connected to the previous film or even Super 8, but are taking place at or near the same time, each with it’s own respective story. It isn’t often that I watch movies that are best seen in IMAX, but this is definitely one that is best appreciated and experienced in IMAX; however, if you want to take the old-school feel of the movie to a who other level, then you may want to consider watching the movie at a local drive-in. However you choose to watch the film, you are going to definitely enjoy the adventure.